This product is available in eBay, Amazon.in, AliExpress. At aliexpress.com you can purchase JBL C100SI In ear Bass Earplugs mobile phone Wire Movement with Mic Original Earphone 3.5mm Metal Plug Cancelling Noise Headset for only $12.79, which is 98% less than the cost in Amazon.in (Rs. 697). 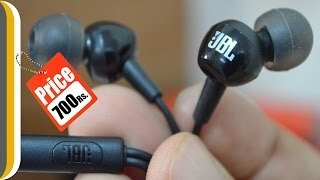 The lowest price of JBL C100SI in-Ear Headphones with Mic (Black) was obtained on March 20, 2019 5:02 am. Make your life more comfortable with the new JBL C100SI in-Ear Headphone. It is a very lightweight and dynamic in-ear headphone. It comes with powerful 9mm drivers that are designed to deliver the feel-it-in-your-bones bass response and high-quality sound that you expect only from JBL. Its light-weight structure is meant for all-day comfort. It comes more powerful with a universal remote control that lets you talk and manage your calls on Android and iOS devices. Answer your calls with the touch of a button. It is available in 3 sizes of ear tips to choose from. Choose the size that is more comfortable for your ears. Get a comfortable and great listening experience for a longer period of time with this JBL C100SI in-Ear Headphones. It is available in three colors – black, red and white. Choose your color that suits best your personality. the manufacturer of this product is 3G gold star. and it not have any warranty.